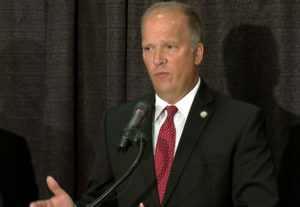 Attorney General Brad Schimel is still hoping to eventually find who leaked documents from a secret investigation to the press. The state Department of Justice released its report last week on the leak of documents from an investigation that targeted Governor Scott Walker’s campaign and conservative groups to The Guardian newspaper. The records showed how prosecutors were attempting to build a case that illegal coordination had taken place. The DOJ found the leak likely came from the former Government Accountability Board, but not enough evidence tying it to a specific person. “We reached the conclusion that, although the leak involved the commission of a crime, we can’t charge anyone because we don’t know who did it,” Schimel told reporters Wednesday. While no criminal charges are being filed, DOJ is recommending contempt proceedings be brought against several prosecutors and former agency staff members. If a judge agrees, Schimel believes that process could lead to new evidence that may eventually reveal the person responsible or information that offers a new direction in the case.